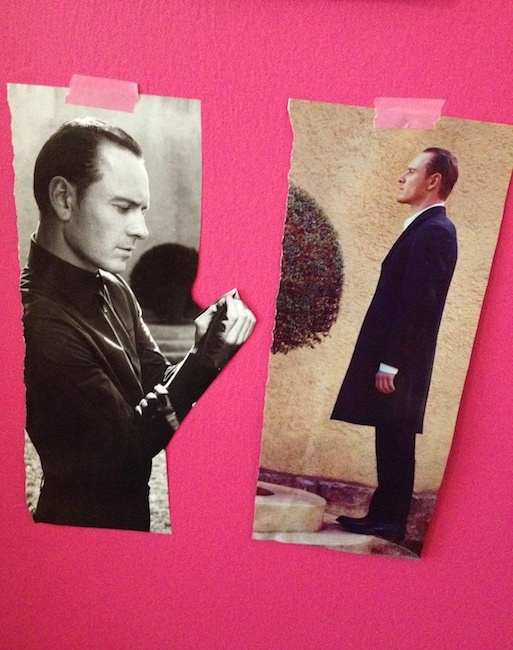 You have the right to remain ridiculous I remind myself as I tape two photos of Michael Fassbender to my wall. They are from Vogue. A famous photographer though I didn’t save the page with the photographer’s name. It’s not Leibovitz, but Mario Testino maybe….The photographer is excised and so is Natalia Vodianova. I’m not interested in her face the way I am in his. The way it is handsome though it shouldn’t be—the nose is overly large, the lips too thin, there’s something almost skeletal about his face, not in a bony way, but the way it reads like a shield or a marble mask. Today I am thinking about Mr. Fassbender. How, if we were friends, I’d call him Cooper, which is what his surname means in German. I am a fan of nicknames, of that intimacy of calling someone by a name, or many names, important to you alone—the result of inside jokes, of shared history, of accidents. Or for no reason at all. Yesterday I was obsessed with Channing Tatum. Not because of Magic Mike, that came later. First I saw 21 Jump Street. I like Jonah Hill; the pickings in Redbox were slim. Then The Vow because I like Rachel McAdams and by then I had started to wonder about Channing Tatum. Why he’s so appealing. (The intonation there is one of wonder not derision.) He’s not that pretty. No, he’s good-looking but in a regular way, in the way the cute boys were when I was growing up. He is not striking. He’s not a good actor. He delivers some lines really well—in Magic Mike, most of them—but he’s not consistent. He’s too earnest somehow, too eager to get it right. Which works sometimes but not when you try to put flowers in his mouth. He’s surprisingly good at awkward. I’ve discovered that I like to watch him for the same reason I like to watch Drew Barrymore, though I can’t put a name to it. It’s ridiculous to say there’s a certain humanness about them, a certain imperfection that I, that I admire? That I crave? That is comforting? I retain the right to remain ridiculous. To spend too much time thinking about people I’ll never meet. Truly as I try to unravel them, I know that I’m really looking for clues about me. Why is this person so compelling? Why do I think I wouldn’t like George Clooney the person as much as I like the dream of him? There are things I’ve learned about myself, things that are uncomfortable to write down. That I’m always crushing on white men though—in theory—I’d date a man of any race if he was kind to me. (It’s ridiculous what a pushover I am for simple kindness. My trouble is that the friendship often outlasts the kindness, and so the shell becomes more airtight even as every day I try and talk myself into breaking off another little chunk.) There are black men I find attractive—Idris Elba, Lenny Kravitz, Hill Harper, John Legend—but they don’t capture my imagination in the same way. I think because it’s hard to see them being different from other people I’ve known from whom I’ve just not been black enough. Who’ve tolerated me as” a black girl who thinks she’s white.” (There was a woman in graduate school who dubbed me the President of the White Girl Posse because in early days of school I refused to go to a BBQ that was only for the black students. She couldn’t see how scary that was for me, how I know all too well that I didn’t listen to the right music or dress the right way or know the right slang.) I know a whole church full of black people now** who think I’m enough just as I am, and still I am amazed that they like me. That they accept me. That they think I’m a good role model for their girl children. So, now my hands are dirty. I don’t feel relief. I feel scared. But also that in this moment I’m doing what I’m supposed to do. I am remaining ridiculous. I know no other way to live. *Letters in the Mail is brilliant. You should sign up. **I feel I should say that I have many black friends who accept me just as I am and don’t subscribe to the theory that being black means liking certain things or speaking a certain way or understanding certain things. We are not a mono-culture nor have we ever been. But my feelings around not being accepted by my own people is one of those personal narratives that is something we are told when we are much younger and that remains indelible even if no one’s telling that particular story to/about us anymore. I’m working on growing out of it. You should read this interview with Nick Offernan. Posted on July 4, 2012, in Uncategorized. Bookmark the permalink. Leave a comment.